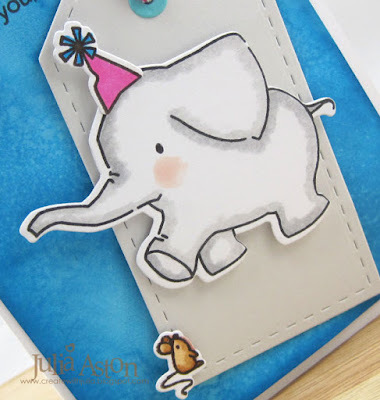 I used one of my favorite birthday stamp/die sets for my tag/card today - Mama Elephants Ella and Friends. Ella is so adorable and she has several animal friends for her to play with - today I used the little mouse and put the party hat on Ella. AND she's so easy to color with just a brush of gray around the edges - I used Copics. To make the blue background, I sponged the white cardstock panel with Ranger Distress Mermaid Lagoon. Then I spritzed water over the panel - let it sit to make watermarks - then dried it with my heat tool. When it was completely dry, I stamped the sentiment in the top corner. For the tag, I used the WMS Stitched Tag die cutting it out of Soft Stone cardstock. I cut the little hole cover out of Hawaiian Shores and looped Caribbean and Pink Sorbet Twine through the hole. I die cut Ella, the hat and little mousie out of white card stock and colored them with Copics. I adhered the hat to Ella's head layered Ella and the mouse to the tag using foam dots. I used foam dots again to layer the tag over the blue panel. 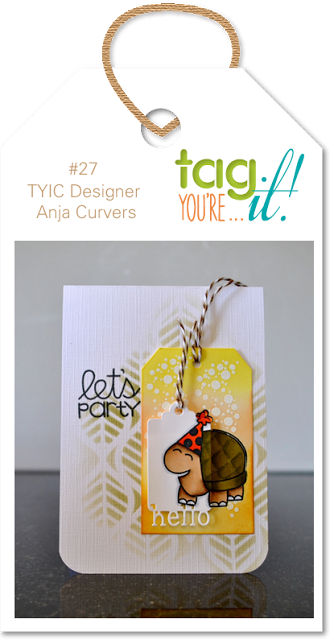 I'm linking my tag card to the Tag You're It Challenge where the sweet tag/card below by Anja Curvers was the inspiration. Accessories: Ella and Friends die - Mama Elephant, foam tape, Stitched Tag Die - Waltzingmouse, Caribbean and Pink Sorbet Twine - The Twinery, water spritzer - Ranger, Copics. this is soooooo cute Julia! love that ellie! That is so adorable, what a sweet stamp! Oh so fabulous... my brother's girlfriend loves elephants so while I don't have any stamps I always look at cute ones and think, "Maybe...". Thanks for joining us at Tag You're It Challenge. 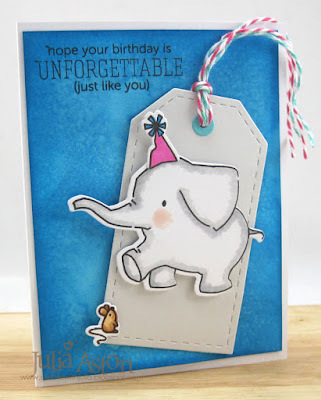 such a cute card.. i love how you added the twine.. This is just too darn cute...what a fabulous card! Oh how I LOVE this birthday elephant and his friend! Beautiful background and I love the soft tag color behind him! Thanks so much for joining in on the fun at Tag, You're It! Such a cute card and great coloring love your take on the challenge. Thank you for joining us at Tag You're It. I'd say this adorably sweet (which it is), but it's so beautifully done, the first description falls short. So let's just say 'adorbsweet-beaut'. (oh that's awful!). Honestly love it Julia, but then I love everything you do!